Finally, after over a year of going into Sunwell on a weekly basis… This glorious shiny item dropped. 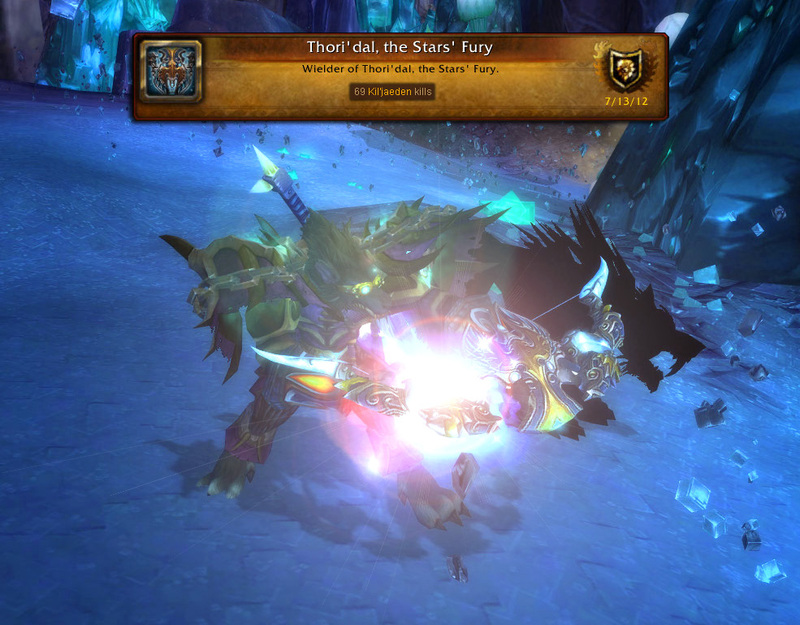 Here’s me wielding Thori’dal, The Stars’ Fury. I also have Thunderfury, Blessed Blade of the Windseeker on my back but you can only really see the handle of it. It took 69 Sunwell runs and 69 Kil’Jaeden kills for it to drop. I would like to thank my guild for the constant support every single week, there were a lot of them who helped me out over the course of these 69 weeks and I’m deeply thankful for each and everyone of them to have shown me their support this long. Thanks Vex! Wowhead reports the droprate for this item to be 7% (1 in 14 chance), which are pretty damn good odds for a legendary to drop. But that doesn’t mean you can’t be unlucky with the random number generator. Let’s take a look at some statistics to help understand the situation better. As you can see, it’s very statistically improbable that you’d need to go into Sunwell 69 times to see the bow drop once, but that’s just it. It’s all statistics. Every time you go in there you have the same 7% chance and it doesn’t matter how many times you do it, you’ll always have a 7% chance, every single time. But in all likelihood, you’ll see the bow drop once far before 50 attempts. Update (22/07): My friend Harzufelt put together this video about the long and epic quest to obtain the legendary bow! This is my 2nd legendary and therefor also the last legendary I can obtain and earn an achievement for as a hunter (for now). My first legendary was Thunderfury, Blade of the Windseeker (click for pic). Maybe it’s time to try out another game for a little while, just until Mists of Pandaria is released… Steam Sale, here I come! This entry was posted in Achievements, General, Reflection and tagged achievements, world of warcraft, wow. Bookmark the permalink. Grats so much. 🙂 It really is beautiful! @Lae: I seek out the hair pullingly rageinspiring moments, not sure why tbh. But I always do… I complain while I do it but then when I’m done I feel pretty pleased about it. (The fox for example took me a few thousand fox kills). Regarding the all-hunter battleground; well sure. That sounds like just such a situation as we just discussed. 😀 Sign me up! Remind me to put my wolf in the stables though, he’d lose his oil if I brought him into a battleground. I am totally jelly – I really need to start farming that place… Also I must make a bucket list! I find I am all over the shop atm… login for a BG.. OH I’ll farm for frostbitten!… OOOOO LOOK A SPIRIT BEAST! !… That reminds me.. level that hunter alt!!! Grats gav, Where to now? Well some of us stil want Heroic Madness. Also I’d like to complete T6 on my priest; I heard you know your way around Sunwell plateau! @Aybar: We’re still gonna do heroic DS as long as people sign up for it. We have a list of who still needs what achievements and what heroic bosses to complete their meta achievement and we’re doing our best to make sure everyone gets it. (and yes, I know you ONLY need hc Madness at this point)!